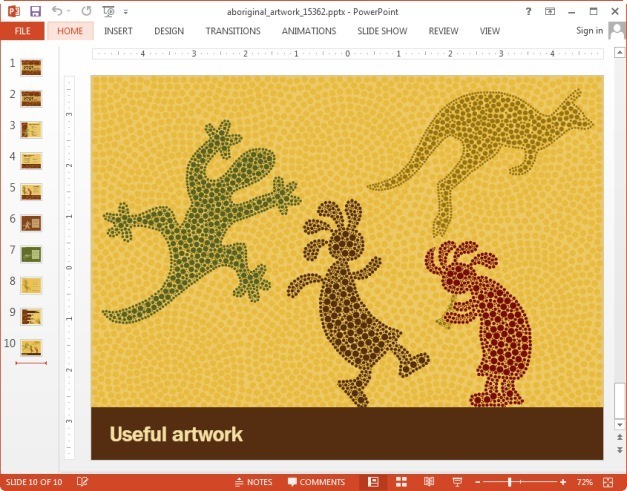 If you are looking to create a presentation about arts, native cultures, travel, tourism and particularly the Australian Aboriginal culture then you should check out the Aboriginal Artwork Template for PowerPoint and Keynote. 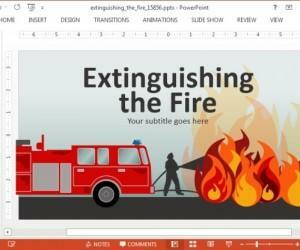 This animated template brings a fresh approach towards making presentation slides, i.e. 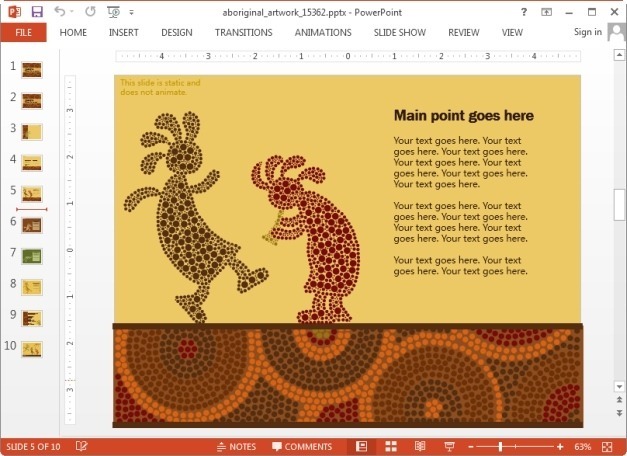 by using aboriginal art themed slide designs which can help add novelty to your slides to enable you to create attention grabbing presentations. 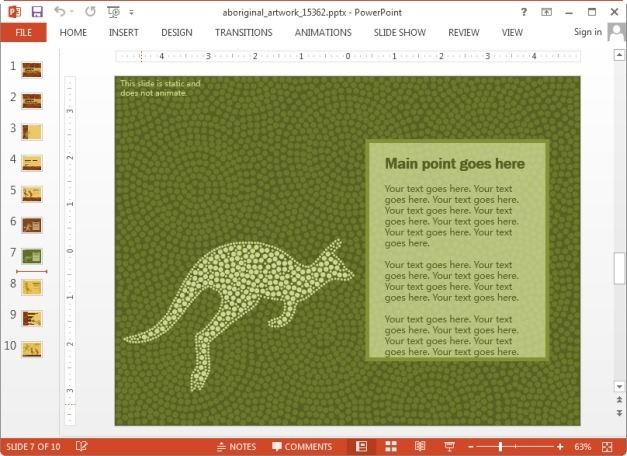 The slides in this template have been designed to provide a down to earth feel. Despite that the template has the most elaborate textured backgrounds, which are eye-catching but do not have an overpowering impact on the viewer. 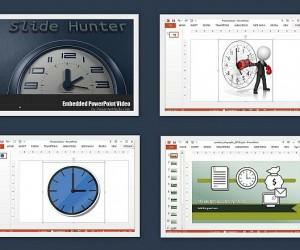 One of the highlights of this template include the wide range of layouts that offer creatively designed sample slides. The placeholders have been cleverly added in such a way that your text is able to standout from the colorful background. 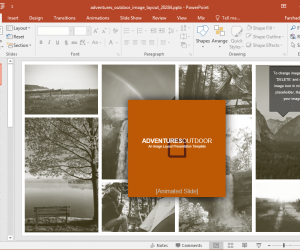 This is because the textboxes overlay the background with a light solid color, with dark, bold text. 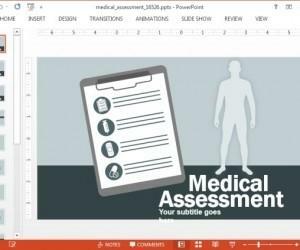 At other instances the text easily mixes with the background design, where you can make use of the empty space to create text-heavy slides. 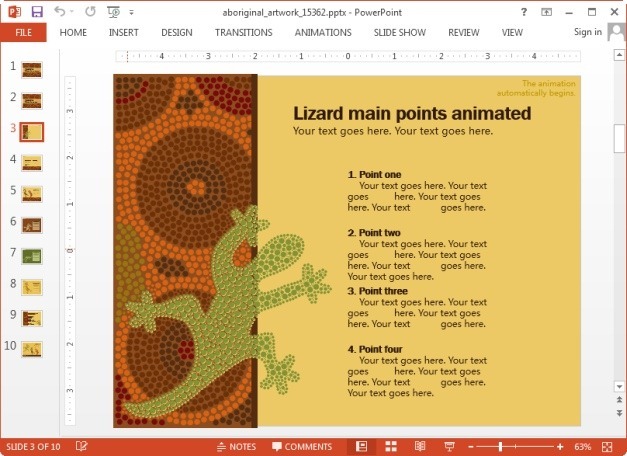 The slide shown below, for example, can be used for making bullet lists and agenda slides to highlight key points from your presentation. 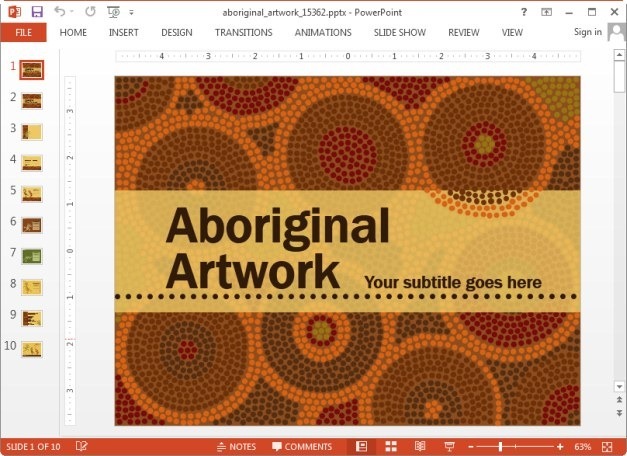 Hence, this template can help you give your audience the right feel when delivering a presentation on Aboriginal culture, nature, desert life, tourism, history presentations and a range of other topics. 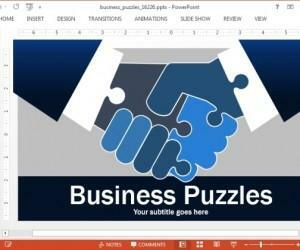 Like other animated templates offered by Presenter Media, this template too comes with clipart images that can be copied and reused across your slides. 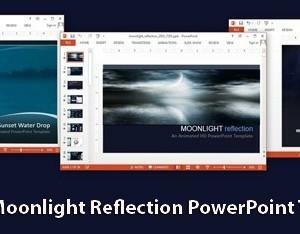 You can also resize these images using drag and drop, to create your own custom slide designs that best match your requirements.